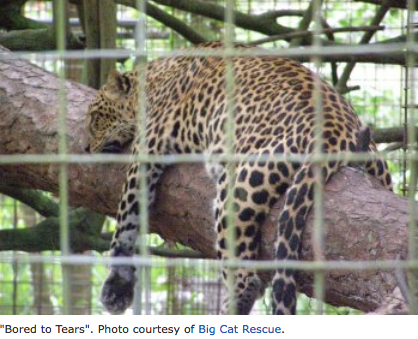 Lisa Tekancic, president of the WildCat Conservation Legal Aid Society spoke with Laurel Neme on her "The WildLife" radio show and podcast about captive wildcats and the wildcat pet trade. During her interview, Lisa describes the history of wildcats in captivity—from the Roman spectator games and royal menageries—to their current status as private pets; for commercial use in the entertainment industry, roadside zoos, and pseudo-sanctuaries; the ill affects and dangers involved with keeping wildcats; and provides an overview of the current applicable federal, state, and local laws. She notes the only thing that is predictable about a wildcat is its unpredictability; that wildcats will always be wild despite years of captive breeding; and shares some behind the scenes stories on Las Vegas entertainer Roy Horn, Christian the Lion, and big cats used in the making of major motion pictures, including Gladiator. This interview originally aired February 15, 2010. The interview was transcribed by Jordan Schaul. From bobcats, lynx, and pumas to the thousands of lions, tigers, leopards, cheetahs, and little wildcats living in captive environments, the WildCat Conservation Legal Aid Society is solely devoted to ending the commercial exploitation of all wildcats. Its primary objectives are to drastically reduce and subsequently eliminate the private ownership of wildcats as pets; wildcats held in roadside zoos and pseudo-sanctuaries; using wildcats for entertainment purposes; as well as hunting, trafficking, and trade of wildcats. Lisa Tekancic is an attorney in Washington, DC and founder and president of WildCat Conservation Legal Aid Society. Their mission is to protect and defend all native and non-native wildcats. Lisa is an active member of the DC Bar’s Animal Law Committee and has organized and moderated two legal conferences: “Trafficking, Trade, and Transport of Wildlife,” and “Wildlife and the Law.” She presented a paper on the methodology of “Animal Ethics Committee” for the International Conference on Environmental Enrichment, and for four years was volunteer staff at the National Zoological Park’s, Cheetah Station. The following is an excerpt from “The WildLife” with Laurel Neme, a program that probes the mysteries of the animal world through interviews with scientists and other wildlife investigators. “The WildLife” airs every Monday from 1-2 pm Eastern Standard Time on WOMM-LP, 105.9 FM in Burlington, Vermont. You can livestream it at http://www.theradiator.org or download the podcast from iTunes, http://www.laurelneme.com, or http://laurelneme.podbean.com. This interview originally aired on February 15, 2010. Photos are courtesy of Big Cat Rescue (www.bigcatrescue.org). 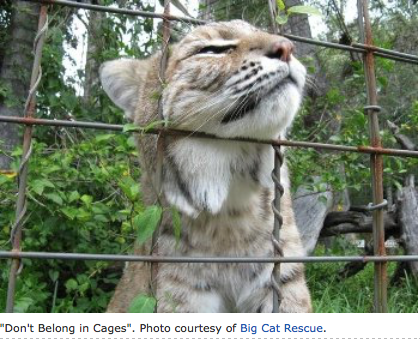 Laurel Neme: : What is the history and culture of wildcats in captivity? Lisa Tekancic: Wildcats certainly have a unique history, especially with respect to their interactions with humans, or I should say humans taking them out of the wild. Going back thousands and thousands of years, the cats were revered by princes and queens and emperors and kings and were a symbol of power and wealth and they were exchanged as gifts between different countries and different rulers. Actually, quite a number of them had a sort of menagerie—royal menageries, where they had a collection of wild animals. During this time they weren't necessarily as we see the animals in a zoo today. There'd be a pit or a ramshackle cage where the animals were kept, and a lot of times they were displayed or put on parade. So they weren't really exhibited like we exhibit the animals today. Most tragically, though, for the cats was during the time of the Roman gladiator games—a number of the Roman rulers killed off thousands and thousands and thousands of tigers, leopards, and lions. They were used for sport during these games. The gladiators would go in and you'd have a gladiator and a cat fighting until death, and a lot of times the cat won. They were also used to kill criminals. They would put criminals in the arena and send out three or four tigers to tear apart a criminal—these were the Roman spectator games; they went on for a number of years and could have very easily caused the extinction of a lot of our cats because so many of them were killed during that time. Finally, public awareness, public perception, finally the games were done away with. The games continued until around the 12th century. There were pockets in Europe where the games were still going on. Laurel Neme: So then what happened? Lisa Tekancic: The collections still went on. So the kings and the rulers, of course, still exchanged wild animals, and specifically the cats, as gifts. And there were a number of menageries all over Europe, France and in London. Just recently they discovered—well, actually, they had them for a while, but they radiocarbon dated lion skulls and leopard skulls that were found in the Tower of London. The lions and leopards held in the Tower of London were part of the king's collection at the time, and they dated back to 1250, I believe, some in the 1300s. So the cats were being kept in captivity for quite a while. But, again, these were wild wildcats—they were taken out of the wild. 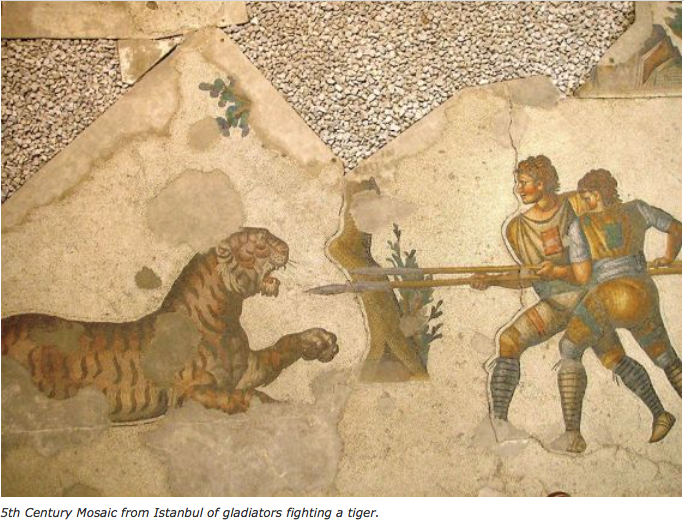 5th Century Mosaic from Istanbul of gladiators fighting a tiger. Laurel Neme: Were they ever bred in captivity? Lisa Tekancic: Occasionally, a birth would be had because the cats were kept together and if you had a male and a female—tigers and lions are prolific breeders, even in captivity. But then as people migrated to America—to The New World, the cats also came. And not just the cats—elephants—all kinds of wildlife, came to the United States. Laurel Neme: What is the history of wildcats in the United States? Lisa Tekancic: The first lion came to the United States around 1760 and is known as The Lion of Barbary. He was exhibited all over including personal homes. After about 20 years, the whereabouts of where that cat ended up becomes unknown. And then there was a tiger brought over not too long after the lion, and he was exhibited in a tavern in Massachusetts! 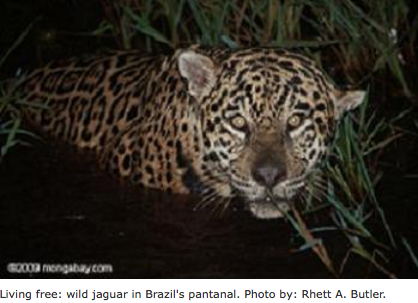 Laurel Neme: So people have always liked to see these big cats and wildcats. Lisa Tekancic: Yes, there is a universal attraction to these cats. They're graceful, they have beauty, and they have power. And that seems to be attractive to everyone, men and women, whether or not you're wealthy or poor. These cats really do convey a status of power and beauty and grace which is a major attraction for everyone. Laurel Neme: Were there other kinds of cats that came to the U.S.? Lisa Tekancic: Leopards showed up after that and then as we move into the 18 and 1900s, more and more cats kept coming over and they were used for menagerie purposes, if you will, private collections. People that had some wealth would have the cats brought over. And then from that, emerged the early circus. People started taking the cats and they'd train them to do some tricks or they'd imitate the old gladiator games in the arena or whatnot. And then we started having what we know of the zoo collections today—still very early though, not as elaborate as the exhibits are today. The zoos try to make the exhibits, especially for the larger carnivores, more of a natural type exhibit but back then they were just in cages and fenced areas. Laurel Neme: When did zoos sort of become a big thing in the United States? Lisa Tekancic: That really happened in the 1960s—and what happened was Life magazine ran a big expose on the problems with the animals coming over from the wild. They were kept in very small, cramped cages, they weren't fed, lack of ventilation, and a lot of the animals were dying in transport. And at the same time in the 1960s there was a big environmental conservation push, one of the first ones, and so there was a public outcry at that time as far as taking any more animals out of the wild for commercial purposes. These animals were being used for the circuses, for the zoos, for private owners, you name it—the entertainment industry, the film industry. And so what the zoos decided, to save face with the public, which you can't blame them, is they decided that they were going to breed their own animals for their collections and said we're not contributing to the extinction problem. We're breeding our own animals. We're going to supply our own cats from the cats that we already have in captivity. So we're no longer taking cats out of the wild or a lot of the wild animals, elephants, what have you, primates, we're going to do our own breeding. And that's when it really took hold here. Laurel Neme: Was it easy to breed cats? 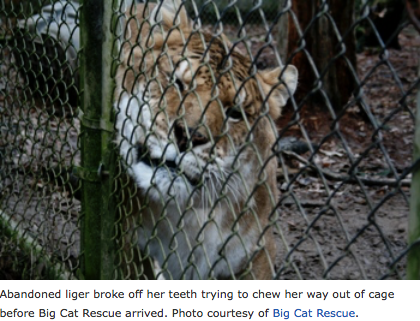 Lisa Tekancic: Tigers and lions breed very easily in captivity, other cats don't. Cheetahs are problematic, clouded leopards are problematic. Leopards, African leopards, do pretty well, too. Some of the smaller cats have a problem with captivity and reproduction, but for the most part they were successful. Laurel Neme: Did that put a stop to taking wildcats out of the wild? Lisa Tekancic: What happened was the zoos had many more animals than they needed, and so then we see an emergence of a different sort of dealer, and a commercial breeder. So then you had people breeding—private breeding going on that would supply the animals for entertainment, for the circuses, for other commercial venues, and that's where we had the sort of big explosion in the population of surplus animals. Laurel Neme: So you started having a surplus of animals. Are they all tigers, or is it a range of species? Lisa Tekancic: No, it's a range of species; it's not just limited to the cat species. There are primates and monkeys, reptiles, and birds. It runs sort of a gambit of any and all wild animals. 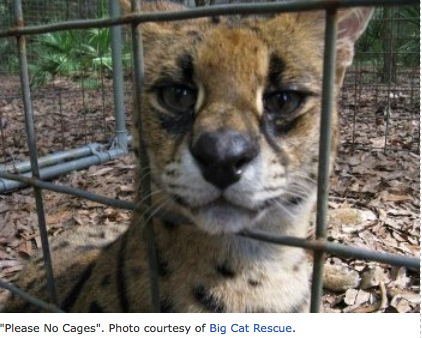 Laurel Neme: Why are captive wildcats a particular issue? Lisa Tekancic: The thing, especially with the cats is, just because we breed them in captivity doesn't change their nature especially with lions and tigers, the bigger cats. These are large carnivores, they're predators. They're natural hunters, natural killers. They're very strong. When you see a 650 pound tiger that's solid muscle, and its nature is to hunt and take care of itself, it can bring down prey twice its size, and to put them in a captive setting—and just because they're born in captivity or maybe they've even been hand-raised by humans—doesn't change their natural instincts and their natural behaviors. It's very dangerous to have these animals unless they're in a situation where the person that is taking care of them is highly trained—specialized training—with these cats and even then you have problems with these cats. So when you take it down to an individual that wants one of these animals as a pet, if you will, that becomes very problematic and very dangerous because these cats are wild—just ask anyone who has a domestic cat—you know how unpredictable their behavior can be. And even though one minute they're quiet, the next minute they're not. Laurel Neme: What is a typical outcome? Or what is a usual outcome of people having a pet tiger? Lisa Tekancic: Unfortunately what usually happens is they just get too big and they just get too costly for people to care for them, so they do end up—they can end up at a sanctuary, they can end up going to auction, they could end up at a dealer. A lot of times the cats are unfortunately, euthanized, so it's very tragic. Laurel Neme: Given all that, is there a rationale for having wildcats in captivity? Lisa Tekancic: There is, I guess, a rationale for having some of the cats in captivity with respect to trying to save the species from going extinct. On the other hand, I think that it needs to be very limited. We don't really necessarily need these cats in the hands of a private owner. It's not saving the wildcats, this isn't education, this isn't conservation, it's just a commercial activity—the pet trade. So in one respect, you can justify having some of them in captivity, but I think it needs to be very limited. There needs to be a line drawn at some point with respect to them because a lot of the cats are abused, they're neglected, they're not properly taken care of, they don't receive the right medical treatment, and what's the point? These cats just suffer. They just suffer so much and it's just not necessary. Laurel Neme: Why does that happen? Why is it so common? Lisa Tekancic: For a lot of folks, they acquire these animals when they are quite young and they are very cute when they're cubs and no one can deny that a lion or a tiger cub when they are a month old or two months old aren't the most adorable thing in the world, but what they forget is that within four to six months, you've already got a pretty large carnivore on your hands—and they are very active; they’re very strong and really, what do you do with this animal? Laurel Neme: I'm struck by very wealthy people not being able to care for their exotic pets, like Michael Jackson, with all the resources in the world, had given his chimpanzee and his tigers and giraffes to sanctuaries. Lisa Tekancic: Tigers are very costly. They're meat eaters and it's very expensive to keep a meat eater happy and healthy. It can cost, I've heard people say it costs anywhere from $1,000 to $5,000 on food alone. You have to make sure they have the proper shelter; you have to make sure they have the proper vet care, and when you're looking at an adult tiger, for a vet to come in and take care of it, it has to be sedated. Obviously, you're not going to handle a 600 pound tiger without it being medicated, so that becomes costly as well. Laurel Neme: Can they be domesticated or tamed? And what's the difference? Lisa Tekancic: Ah, that is a very good question. Carnivores have very unique characteristics and the cats do as well. There were some recent studies done on what makes an animal, any wild animal, favorable to the domestication process. Laurel Neme: What are some of those favorable and unfavorable characteristics? And where do cats fit in? Lisa Tekancic: Characteristics that they list as unfavorable for domestication are things like their social structures, they're territorial, they either have an established family group or they're solitary. Males are in separate groups, they have a specific food preference, and being a carnivore is one, they are meat eaters that’s pretty much all they are—meat eaters. With respect to breeding, they pair bond prior to mating, females are dominant or males appease the females. Laurel Neme: So these sound very much like cats. Lisa Tekancic: Yes, right. It sounds just like cats, doesn't it? You don't even have to—and these are the conditions for any wild animal, not just cats. But when you go through the list and here are some other examples, naturally aggressive, difficult to tame, difficult to control, avoids attention and are independent, have large home ranges, highly agile and difficult to contain. When you look at all of the characteristics that the scientists have listed as unfavorable with respect to domestication, they're cats. Avoids interaction with humans—that's probably one of the most important, besides being a carnivore, because when you look at the definition of tame—people sort of use tame and domestic to mean the same thing—tame sort of means the same thing as domestic, but tame is actually attributed to an individual animal, and not a species, an entire species or an entire species family like the cats. So you might have a cheetah in captivity that people describe as tame and the only thing that means is that particular cat puts up with humans a little bit better than say Cheetah B. So Cheetah A will actually tolerate humans a little bit better than Cheetah B. It doesn't mean it's domesticated, it doesn't mean the entire cheetah family is domesticated; it just means it tolerates us a little bit better than the next one. Laurel Neme: Are there cases where, despite an animal being tame, it ended up turning on its owner? Laurel Neme: What can trigger an attack like that? Lisa Tekancic: Anything can trigger it—a noise, an unfamiliar smell, hunger—anything that alters their environment. They're very territorial. They're more territorial, again, going back to those unfavorable characteristics, than they are relationship driven. Cats are very in tune to their environment and their territory more than the person. If you move domestic cats, people will ask if they had any behavior changes. You moved and cats don't like being moved. Then you think, well, I'm with them, so they should be fine. Well, that’s not necessarily true. Cats don't like being out of their environment, that's why they don't even do well if you try to kennel them when you go on vacation. Cats really need to stay at home and have a cat sitter versus taking them to a kennel while you're gone. They want to be home. They don't care if you're there or not. They just want their territory period. Laurel Neme: So then how does that work with circuses or with these traveling large cat shows? Lisa Tekancic: Oh, it's very hard on the cats. Laurel Neme: Can you tell me more about wildcats being used in the entertainment industry? Last August (2009) a big cat act came to Vermont’s Champlain Valley Fair with 12 tigers and one lion. It was quite controversial because it seemed this big cat act was purely for entertainment rather than for education or conservation. In fact, one of the major sponsors’s pulled out. Lisa Tekancic: The cats are used for films, for commercials, for mascots for universities, and when you see them in a setting such as a magic act or a circus or some kind of show, while the promoters and the handlers try to emphasize some sort of education component with it, truly it's not. I think it makes the public feel better, if you will, if people feel that the cats are being used for greater good and not just for entertainment, but when you get down to it, it's really just an entertainment purpose. People are fascinated by these cats so they want to see them, but to see a full grown tiger do a trick is quite far removed from what the cat actually is—its natural state in the wild. Laurel Neme: Can you tell me more about the use of wildcats in other areas of entertainment, like the film industry? Lisa Tekancic: That's actually starting to change. Lisa Tekancic: More and more, now that we have this phenomenal computer technology, it's called CGI, computer graphics imaging, where they can actually manipulate computer images or use animation puppets or they might take a cat and film it in front of a blue screen in various poses and then sort of superimpose that into the finished product, versus having actors actually interact with the cats, it's very dangerous, of course—we keep using the example of Roy Horn, but that can happen at any moment. Remember the film, Gladiator? Here is a piece of history reenacted—tigers that were captive bred and used for entertainment were brought onto the set of Gladiator. The animal trainer for the film, Paul Reynolds, said that it's very difficult, especially when you have a number of cats. You can't always use the same cat for one scene, so you might have six or seven cats available, and lions, too, and people are naturally curious—they want to see them. Reynolds said in an interview he had a really tough time on set, especially when there were small children around, to keep them away, because the cats are very dangerous. He said—and I love this quote—the only thing that's predictable about a tiger is it is unpredictable, and it doesn't matter if it was bred in captivity or taken out of the wild. So they incorporated a lot of CGI with the tigers—the tigers were on chains, and if you watch the sequence in the movie, really watch the tiger sequences, you can see the tigers are on chains and you can see in one scene, the tiger extends its leg and its paw out and almost hit Russell Crowe—you can see it if you're really paying attention to it. Lisa Tekancic: Yes, it came very close, very close to swiping him. And so there is a danger involved in using them in film, and more and more they're getting into the computer graphics and trying to use them less. When Chronicles of Narnia came out, the first one, for Aslan, they decided to use a mechanical lion, which, if you've ever seen that movie or are familiar with the story, I think it would be kind of hard to use a real lion for that particular film. They did use several puppets, mechanical puppets and CGI technology. Laurel Neme: What about other films—unlike in Gladiator or Chronicles of Narnia where tigers and lions are central characters—where a large cat has a minor role, like in The Hangover? Lisa Tekancic: That's really sad, too, because when you think about it, is it really necessary to have that tiger in the scene? I didn't see the movie, so I'm not too familiar with it, but from what I got, I guess the tiger shows up, these guys are out on a binge drinking night or whatnot and the next morning there's a tiger, I guess, in the room or something, which is kind of sad. How does that really help conservation or save the animals in the wild? When you think about it, at some point, we're going to have to decide how we actually want to use these animals. Using wild animals is a huge commercial industry, and whether it's for entertainment or for pets or what have you, is that commercial activity really necessary? I say no, but then other people say, what's the harm? Laurel Neme: What is the harm? Lisa Tekancic: There is a rationale to having some cats in captivity with respect to trying to save the species from going extinct. There is a plausible reason for keeping some cats in captivity. But when you start paring it down to all the different environments with which the cats are held in captivity and used—then I think you have an argument for limiting human activities—especially on the commercial side. 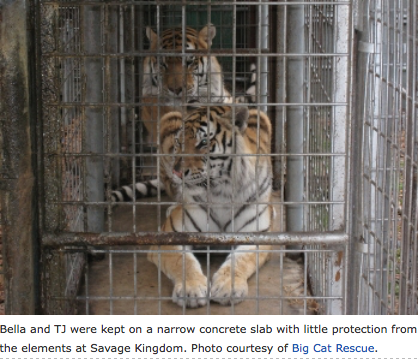 Keeping the cats in captivity just for the pet trade—to breed these cats just so someone can have a tiger as a pet is not necessarily promoting anything but a commercial activity. Laurel Neme: Which are the most valuable wildcats from a commercial perspective? Lisa Tekancic: The most valuable wildcat is a tiger. Tigers have been exploited for so long for use in medicines—their bones are used in medicine, their meat, and their skins. They are listed right now as endangered and so trade is prohibited. There is a ban. You cannot trade in wild tiger products at all. But even in captivity, what has happened is a lot of the countries have established their own domestic laws with respect to tiger farming. You can't take a captive tiger here in the U.S. and take it out and shoot it and then slice it and dice it and send the parts all over the place. That is illegal. Laurel Neme: Tell me about the laws. What laws at the state, federal and international level, govern keeping cats in captivity and also their commercial use? Lisa Tekancic: We have a number of laws; federal, state and local. Just so your listeners know, most of the laws, especially at the federal level, are commercially oriented, meaning that the laws are not necessarily animal right laws or animal welfare laws. What they do is limit what humans can do with respect to these animals in a commercial setting. Laurel Neme: What do you mean? Lisa Tekancic: Even the Endangered Species Act puts limits on what we can do as far as trade, depending on the particular species and how they are listed conservation wise. For instance, tigers are endangered, and whether they're born in captivity or not, there are restrictions with respect to trade in live cats and trade in products. You cannot trade in tiger parts or products, whether it's captive or not. There is a ban on that. Lisa Tekancic: Correct. You cannot trade in any sort of tiger part or product right now, and that's because of its listing. Laurel Neme: And by that you mean that it's been listed or categorized as endangered or protected by law. Lisa Tekancic: Correct. 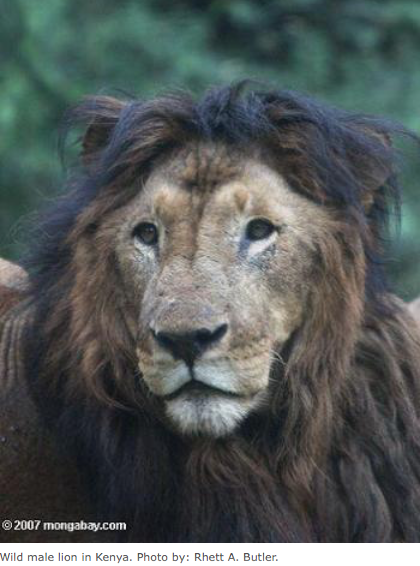 Now, lions, African Lions specifically, don't have the same trade restrictions as tigers do. So that becomes problematic. For other cats as well, as I said, it depends on their listing. Laurel Neme: What about laws for the pet trade? Could I own a lion? What would I need to do if I wanted to? Lisa Tekancic: That depends on where you live. The state laws are somewhat all over the place with respect to pet ownership. At the federal level, they do not regulate with respect to pet ownership, but do regulate commercial activities. So under the Animal Welfare Act, there are three different licenses. You can obtain a license to be a commercial breeder, or a dealer or an exhibitor. Laurel Neme: What is an exhibitor? Lisa Tekancic: The exhibitor license under the Animal Welfare Act is where it gets a little dicey because that covers pretty much anybody other than a dealer or a breeder. So if you are a zoo, even the National Zoo, or a sanctuary or a circus or anything with respect to exhibiting the cat, even say if I have a cat and I want to take it to a Wal-Mart parking lot, then I am considered an exhibitor. So everybody else sort of falls under the exhibitor license, and that leads to the problem that we see at the state and local level because where the states semi regulate or have a permitting scheme, what happens is they'll say, well, you can't necessarily have an exotic cat, and usually they'll define that, or a wild animal or a wildcat, and they'll define that and that's all over the place, too, by the way. But if you have a federal license under the Animal Welfare Act as an exhibitor, dealer or breeder, then you can have these animals. Laurel Neme: How does it work in practice? Lisa Tekancic: What happens is people that have these animals as pets apply to the U.S. Department of Agriculture (USDA) and receive an exhibitor's license, which is very easy to get and circumvents the state laws. Laurel Neme: It's the U.S. Department of Agriculture that handles the Animal Welfare Act and handles those licenses?—Breeder, dealer and exhibitor licenses? You can bypass your state law by just obtaining an exhibitor’s license. Just for an example, in Maryland, I believe it was last year, a lady had a small monkey as a pet, and in Maryland you can't have a small monkey as a pet. So she did what most people do because of the federal licensing exemption, she became an exhibitor under the Animal Welfare Act. She takes the monkey to a school assembly or whatnot a couple times a year and that's it. She satisfies the exhibitor portion so she qualifies as an exhibitor and she can keep her monkey. Laurel Neme: Are there any requirements with that license or inspection? Lisa Tekancic: There's supposed to be an inspection. There are some things, depending on the animal that you have, with respect to a veterinary care plan, caging requirements, housing requirements, a feeding plan, and as long as you have all those things and you pay your fee, which I believe a couple years ago was only $100 to get an exhibitor's license, you're all set. Laurel Neme: At the state level, you said that the laws are really all over place, but the states are the ones that have the power to control the keeping of wild animals. Now, there are a lot of strange laws and I wanted to talk about what the challenges of the laws are and where the gaps in the laws exist. Lisa Tekancic: Well, that’s because each individual state designs their particular dangerous animal law. There's very few that don't have some sort of regulations, the difficult part for us is they make the exemption if you have a federal license. Laurel Neme: Can you give me some examples of the variety of state laws? Lisa Tekancic: Some states, like Vermont, say you can't have the wild animal at all, and we're not going to issue a permit unless it's for a bona fide education or scientific study, which is interesting because then you need to define—well, how do you define education? So that's interesting because that is a very broad definition with respect to what you can't do or can do. You could also have a state that says, the cats are okay; you can have the cats, we have a permitting scheme, but then your local authority, whether it is a city or a county ordinance will say, within these limits, sorry, folks, you can't have these cats. Laurel Neme: So the laws can be all over the place at the county, state, and federal levels? Laurel Neme: Can you give me an example of that, where the state says it's okay to have a large exotic cat, like a tiger, but the county says no? Lisa Tekancic: Ohio is an example of that. Ohio does have a permitting scheme with respect to a healthcare certificate. They have been trying to get legislation through in Ohio; they call it the Dangerous Wild Animal Act. It hasn't gone through yet. But then you get into the county levels, like Cuyahoga County, and I believe, there are some counties in southern Ohio that say, no, you can't have them. The states and even the local authorities have the power to legislate and enact ordinances based on public health and safety, based on zoning, based on invasive species type issues, biodiversity issues, and so it makes it easier for them [to regulate]. Laurel Neme: So the state and the city can regulate based on health and safety, even if it's not a commercial enterprise. They have more latitude. Laurel Neme: How does this compare to laws on say dogs, like pit bulls? Lisa Tekancic: Ohio has a very stringent law on their books with respect to pit bulls. They do consider them very dangerous and most individuals, if they own one, must have a certain amount of liability insurance, which is $100,000. The dog has to be confined to the owner's property in a locked, fenced yard. It's defined as a vicious dog with all these restrictions. Laurel Neme: The laws are more restrictive, really, to have a pit bull than to have a tiger. Laurel Neme: Depending on the county, of course. Lisa Tekancic: Right. You have to go to your local laws. For people who are thinking about getting an exotic cat, you really have to do some research. Laurel Neme: Tell me more about the commercial side of the market. Lisa Tekancic: It's big. Sadly, you can very easily obtain a cat through auction sites or through dealers, and it's just out there, or through illegal methods. There's a lot of illegal trade going on in the live cats. You could very easily find a tiger—tigers are prolific breeders, even in captivity. They're not stubborn cats in that respect. But the problem with that—and the problem with so many people having these animals at various levels is inbreeding. Laurel Neme: What does that do in terms of the personality of the tigers? Lisa Tekancic: When you inbreed—there’s a reason why we don't inbreed either—you end up with physical abnormalities. You end up with psychological abnormalities. And we're talking about large predators. Why you would want to inbreed a large predator and make it perhaps more dangerous than it already is is beyond me. 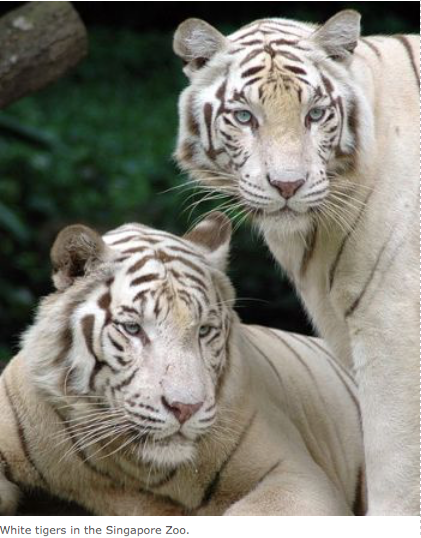 Another thing with inbreeding, especially with tigers, is that is how white tigers are produced. They do not exist in the wild. People ask me all the time—what is the status of wild white tigers and how are they doing in the wild. They don't exist in the wild. White tigers are a product of inbreeding, of human interference. And, sadly, when you look at some of the unfortunate attacks or fatal attacks involving tigers, a number of times they're from white tigers. Montecore, the tiger that attacked Roy Horn while he was performing, is a white tiger. Ron and Joy Holiday down in Florida, they had a sort of magic type show/act with their cats, and one of their trainer-handlers and Joy were both killed by the same white tiger. Laurel Neme: So they become a lot more dangerous and unstable. Lisa Tekancic: Absolutely. There's also a related issue with breeding hybrids. Another popular sort of cat out there, which doesn't exist in the wild, is a liger or a tigon. A liger is the pairing of a male lion with a female tiger, and a tigon is a male tiger with a female lion. If you've ever seen a picture of those cats, or have seen a live one, they are a crazy looking cat. They are enormous. They actually look funny, and, to me, that's an interference that we just don't need to do. There is no conservation or education value in breeding a lion and a tiger together. Because in the wild that would never happen. They would fight. There are very few areas in the wild where a tiger and a lion would actually cross paths anyway. In the Gir forest, there is a subspecies of lion called the Asiatic lion, and they are considered endangered (as opposed to the African lion), so they somewhat exist within tiger territory. But lions and tigers are never going meet in the wild. They just don't share the same geographic areas and if they were to come together they will fight. Even in Africa, where you have leopards and cheetahs and lions existing in the same territories, they are going to fight. They're not going to come together to mate. They look at each other as enemies. They're competition for food. They're competition for their territory. So they will fight. Laurel Neme: Let's talk about some of the laws affecting wildlife sanctuaries and how their commercial activities might be restricted. Lisa Tekancic: Recently, there was an amendment to The Lacey Act with respect to movement of the big cats. Unless you are licensed under the Animal Welfare Act, or you are a state university or a state research facility, you cannot move a cat across state lines. This was one way to help reduce the number of private owners that have no license from moving these cats around and obtaining these cats. But under this new amendment, which is called the Captive Wildlife Safety Act, sanctuaries are defined under this act and they are very strict with respect to what a sanctuary can do to qualify to be exempt under the Captive Wildlife Safety Act. Sanctuaries are not allowed to breed; they're not allowed to engage in commercial activities, with the exception of education, which means you can have people come in and visit, but no contact with the big cats. And they really, really defined what a sanctuary should be, regardless of whether or not there's an exemption to a law. Laurel Neme: So does that Captive Wildlife Safety Act involve other species as well, like primates? Lisa Tekancic: Right now, no. Right now it is limited to the cats, although there is another amendment out there for non-human primates, same thing, and it did pass the House. I believe right now it is pending review by a Senate committee. Laurel Neme: I wanted you to talk a little bit about some specific cases. While we don't really know, folks estimate that there are between 5,000 to 10,000 tigers kept as pets in the United States, and that figure is more than live in the wild. Many of these “pets” live in so-called sanctuaries, of which there are good ones and bad ones. 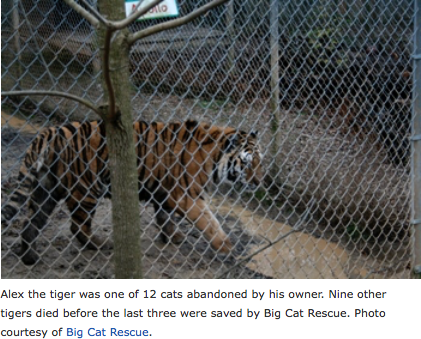 By way of example, one of the bad ones was part of a case in California in 2003 where the sanctuary was ironically named Tiger Rescue, and when the California Fish and Game wardens searched the place in 2003, they found, among other animals, two juvenile tigers and an attic full of 11 tiger and leopard cubs that were so young, their eyes hadn't even opened yet, but they were nearly dead from dehydration. 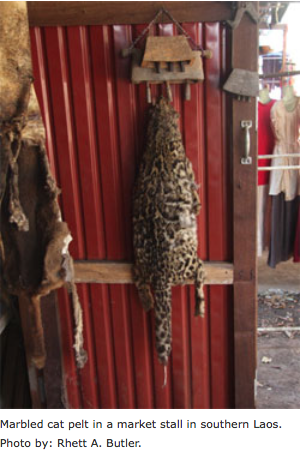 Then in the freezer, they found the bodies of 58 tiger cubs, and in a trailer, a bunch of tiger hides. Can you talk about either this case or some other cases? Lisa Tekancic: Just recently in Canada, a gentleman was killed by his “pet” tiger. It sounds like he had sort of a pseudo-zoo going in his backyard. Sadly enough, and it happens here too, unfortunately, they had problems with the same gentleman and with this particular tiger in the past. So there was a red flag up already on this gentleman and his farm, but nothing was done. Part of the problem is is what do you do with all these cats? Laurel Neme: Can you talk a little bit about enforcement? If there was a law that limited cats—the exotic cat ownership to this bona fide education and research—could it be enforced? What is the problem with enforcement? Lisa Tekancic: It's just like anything else. Unfortunately, wildlife seems to fall off the radar every now and then because, unless you make a human connection to these issues, sometimes it's a hard sell. Unless something unbelievable happens, like with the Roy Horn attack which really got the Captive Wildlife Safety Act majorly into gear and everybody picked up on that. He's a well-known and well-loved performer. For him to go through that —well, it was a major red flag that we need to start limiting these activities with these animals; they're dangerous. It is sad that it’s got to come to a tragedy before we do anything. Laurel Neme: What about investigating specific cases of apparent abuse? Lisa Tekancic: If you have a license under the Animal Welfare Act, USDA/APHIS [United States Department of Agriculture/Animal and Plant Health Inspection Service] is supposed to come out and do inspections which they do. But they have a number of licensees; they are very short-staffed and no money. However, they do go out and when they do see problems they do flag it. When the problems get very serious, they will suspend a license or revoke a license until conditions are up to speed. A lot of times if they find any sort of illegal activity going on, that enterprise will lose the license and the case will go through an administrative proceeding in front of an administrative law judge. But a lot of times, these people remain in business. They may lose their license but then they'll set up a corporation under a different name and appoint a different director, and then that individual will go get a license. So they're still somewhat running. And a lot of times when someone loses their license, they will continue to run a business anyway. Again, they might just reincorporate under a different name and work without a license. The problem is a lack of funds to actually go out and enforce these things. The problem with wildlife, too, is, again, unless there's a direct affect toward humans, wildlife is wildlife. It's sort of a victimless situation. They're not going to come out and say these animals have any sort of rights or legal rights to be protected. And really, the laws, with the exception of state laws, at least at the federal level, are looking at commercial activity and that's a human activity. It doesn't have anything to do with animal welfare at all. It's just regulating what we can and cannot do. Where at the state level, at least they can they bring in that human element. It's public health and safety, it's a zoning issue. But, again, these indirectly protect the animals. They're not animal laws, if you will. And enforcement is tough. Again, when you go into a sanctuary that has 50 big cats, and you know they are a problem, and you know the cats are not being taken care of, whether it's veterinary care or food or whatnot, what do you do with them? Where do they go? There's no other place to send these cats. All the other legitimate sanctuaries are at capacity. They are very costly to keep. It's not like putting a domestic cat in a shelter. Laurel Neme: So what can you do? Lisa Tekancic: Our goal is to start small and start by eliminating the pseudo zoo or pseudo sanctuaries and pet owners. It's a wild animal for a reason. They are never going to be domesticated. Laurel Neme: So, a case like Christian, the lion, which was sold at Harrods Department Store in England, was a pet and then, of course, got too big and eventually was released in Kenya. Was that a success? Lisa Tekancic: Well, it depends. I am very familiar with the story of Christian and how that came to be. Bill Travers, who starred as George Adamson in the original movie Born Free, was the person the boys [Christian’s owners, John Rendall and Anthony "Ace" Bourke] contacted. He kept in touch with George Adamson and they were able to take Christian to George's camp that he had at Kora in Kenya to have Christian become part of George's pride of lions. After Born Free, what happened was George ended up taking most of the lions that were used to make the movie and set up a camp for the lions which were all originally from private owners overseas. All of those cats used in Born Free were captive cats, entertainment cats—and so George took most of them and set up a camp and tried to re-release them into the wild. He was semi-successful in that. A lot of times the cats would go off and they'd come back to George because they knew he'd feed them. So they were sort of semi-wild. They didn't completely cross over. The same thing happened with Elsa, if people remember the story of Born Free and Elsa. George and Joy [Adamson] worked with her quite a bit for a long time trying to get her reintroduced into the wild, and she was sort of semi there, not quite there. They were still keeping an eye on her and they'd still bring her food. What I read in the last book that George had written, in which he talks about Christian, Christian just disappeared one day. That happened with a number of his cats—they were there one day and gone the next. Usually they would come back or he'd find them after a certain amount of time. But then they would just disappear. He [George] wasn't quite sure what happened to Christian. He believed that he was probably a victim of an attack from other wild males. They do tend to fight. They're very territorial, and he believed that Christian probably fell victim to a fight with a wild male lion. Laurel Neme: What can people do if they're interested in the issue of wildcats in captivity? Lisa Tekancic: There are so many things that you can do and education is so vital to this whole area. If you have one particular cat that you love, whether it's a lion or a cheetah or a tiger or a clouded leopard or a snow leopard, learn everything you can about these cats and their behaviors and what they do in the wild and what their prey is and how they raise their young and how they hunt and what they do. Learn about the history of human interaction [with big cats] and how we've continued to exploit them, whether it's for fur or for their meat or for their bones—just learn everything you can and have that respect and appreciation for these cats. You'll find out very easily that, while you may develop affection for these cats, you'll know that having one for your own is probably the worst thing you could ever do. We can respect their beauty and their power and their strength and their courage. [But] do I need to have a tiger as a pet? Do I actually really need to have a tiger skin? Do I need medicine made out of tiger bone? We've come so far with respect to technology, science and education that we know better. We know better now. What we need to do is make up for the past and ensure the future for these animals.